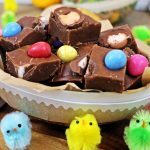 Easter is nearly upon us so I felt had to do something fun and different to my previous Easter posts so I put my brain to work and came up with the idea of Creme Egg Chocolate Fudge! 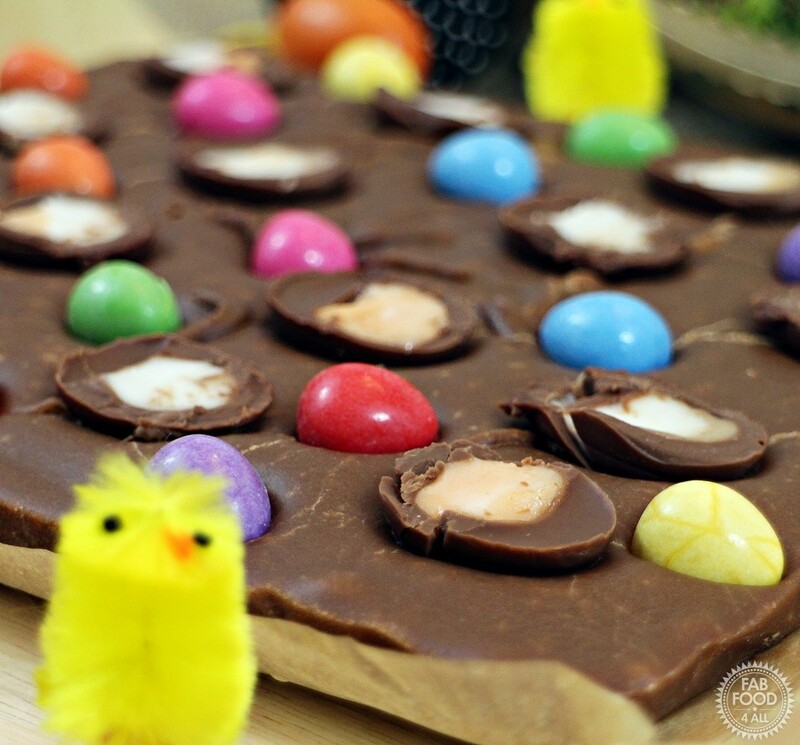 This recipe might come in handy if you find your household with a glut of eggs and you just want to recycle them into something a bit different or maybe you’d like to impress a friend with a thoughtful Easter gift? As a child we had all the usual Easter eggs that are still around today but my absolute favourite thing was a filled cardboard egg. Mum would take me to the local sweet shop and I’d get to choose what treats I wanted in my egg (it’s actually in the background of the 1st picture above). From behind the glass counter the owner would place my individual choices into a paper bag (not like today’s self service) and I think this made the ritual all the more special! Easter was an extra exciting time for sweets and I remember things like foiled chocolate ladybirds with black paper feet, little foiled chicks, foil wrapped chocolate eggs, speckled jelly eggs, fried eggs and more. 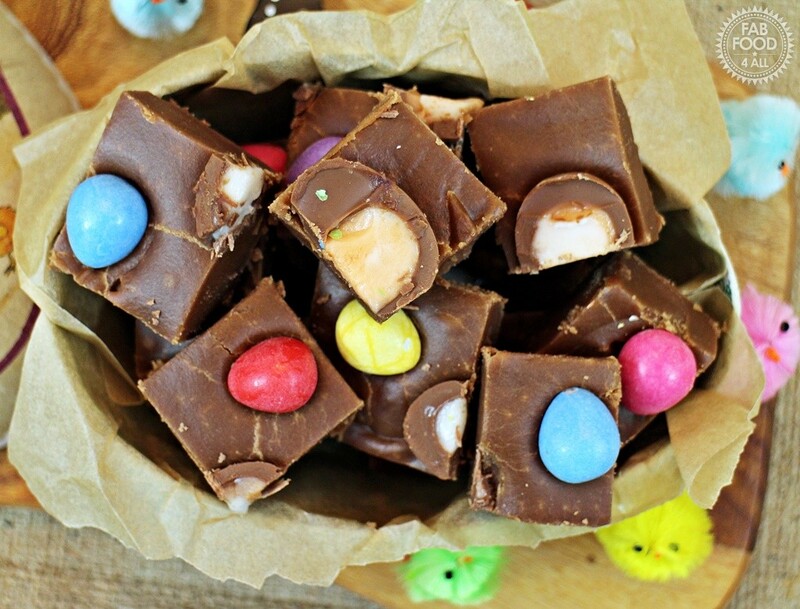 Anyway, back to the Creme Egg Chocolate Fudge, not only are there mini Creme Eggs and mini eggs on top of it there are also Creme Eggs melted into it so if you know a Creme Egg fan then this is definitely the fudge for them! 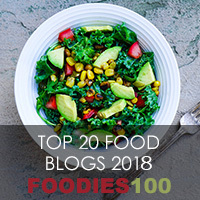 My kids and hubby are constantly sneaking a piece from the fridge when I’m not looking and I may have indulged in a few more pieces than I should myself! What are your childhood Easter memories? Did you have a favourite Easter Egg? Do let me know in the comments below! 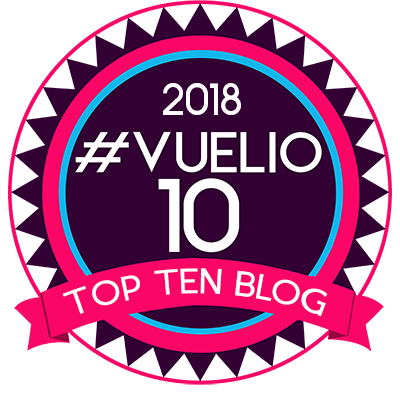 Oh and changing the subject completely, my blog turned 4 on Sunday so I’d just like to say thank you to all my readers, fellow supportive bloggers and all the like minded brands that I work with:-) Here’s the the next 4 years and beyond! Here’s a video I put on Instagram of some of the fudge making stages which you might find useful! 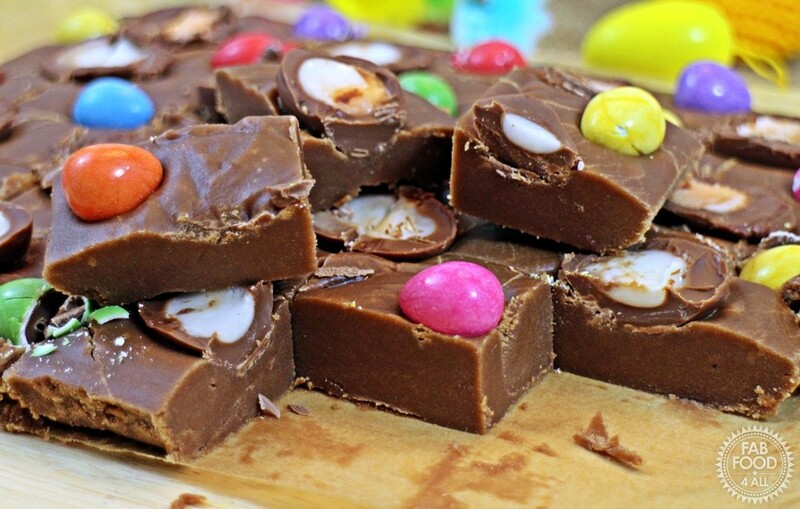 Imagine creamy soft fudge with Creme Eggs melted into it along with dark chocolate and decorated with mini Creme Eggs and Mini Eggs then you have my Creme Egg Chocolate Fudge! Grease a 20 x 24.5cm tin with butter and line with a single sheet of baking paper allowing extra to hang over each end (which will act as handles for removing fudge). Place the sugar, butter, milk, golden syrup and Creme Eggs into a heavy based saucepan. Heat gently and stir until the sugar has completely dissolved (a whisk is useful). Bring the mixture to the boil and then boil gently, stirring ocassionally, for 10 minutes or until it reaches “soft ball” stage of 116ºC (use a sugar thermometer).. Remove the pan from the heat and set aside for 5 – 10 minutes. Beat the mixture with a whisk until it starts to go thick and grainy. Pour the fudge into the tin and even out with a plastic spatula if necessary. 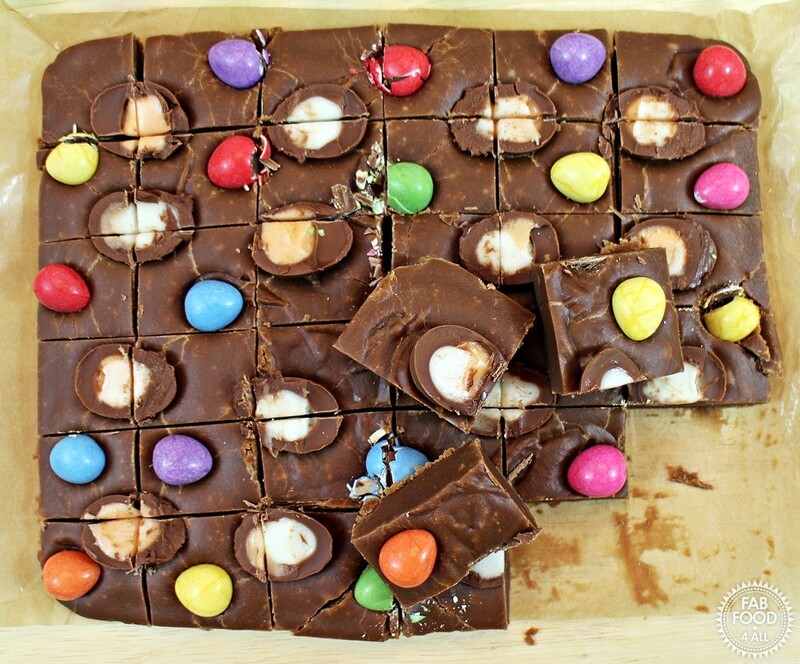 Decorate by pushing the Creme Eggs and mini eggs into the surface. Once cool remove the fudge from the tin and cut into bite sized pieces (I made 36 generous sized pieces). Store in an airtight container in the fridge where it should keep for at least 2 weeks. The chicks are so cute with the delicious looking cake! Er…fudge that looks like a cake!! Looks so bad for me, but I want it! I love the look of the texture of this. It’s the season for it again, too, I should try it! 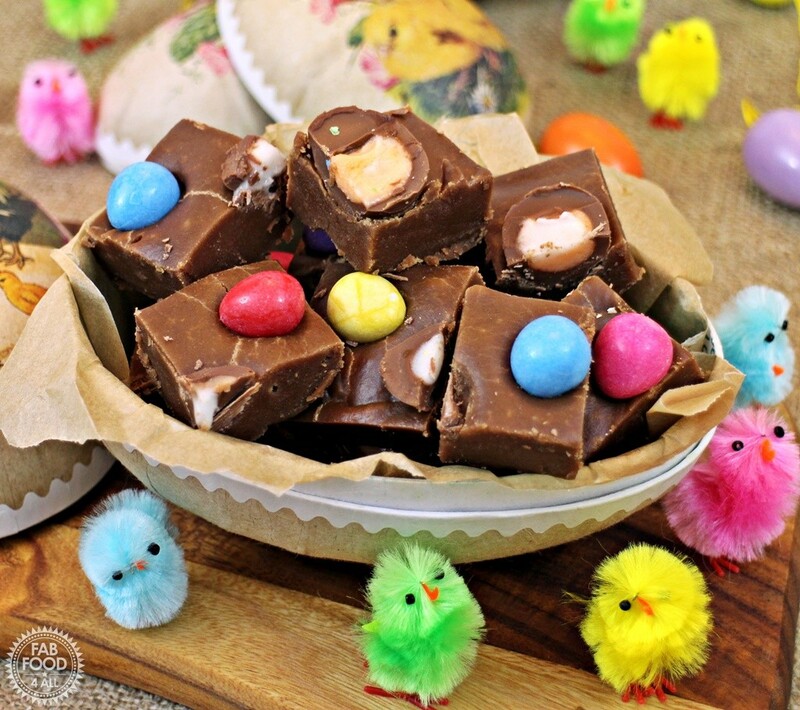 Well I don’t have any mini eggs or creme eggs left over from Easter but this is a nice recipe! Wow, these sound amazing, just the ticket for leftover easter stuff! Ohhh delishious – we still have Cadbury’s Creme eggs left! 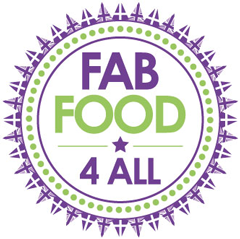 Yummy and fun recipe. I hope you had a fun Easter. 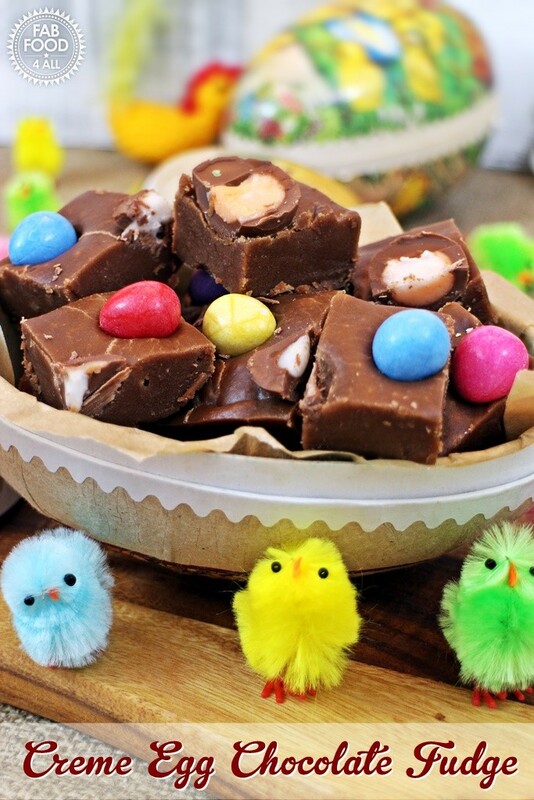 Definitely want to make these with left over easter candy. Thank you Christina, I was a bit a wet one due to the weather so we had an indoor Easter Egg Hunt this year!